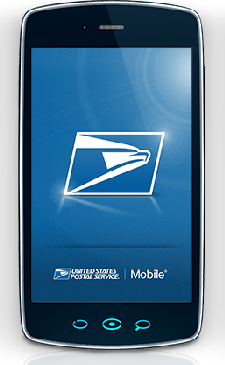 Safety Warning: If you are a Letter Carrier for the United States Postal Service, download the USPS Mobile App immediately. It will prevent severe head trauma caused when your supervisor beats you over the head with your scanner for missing an unreadable scan! First of all, let me begin by saying straight up that I am not a paid shill or PR person for the United States Postal Service. You only have to read a few of my other offerings, such as Mel's Malodorous Mail Machines Memorandum - The Postal Service is Losing the Technological Battle of the 21st Century to get my usual view of the inept technological implementations rolled out by the Postal Service. But with the USPS Mobile App the Postal Service seems to have done something right for a change. Either Mercury is in retrograde, hell has frozen over, or maybe I'm just in a bad mood, but I am really pleased with the iPhone version of the application. Now please bear with me because this is my first foray into the technical review realm, but I'll do my best to explain some of the neat features of this App, and in the process expound upon how it can be of use to the postal clerk or letter carrier, or to the every day postal customer. 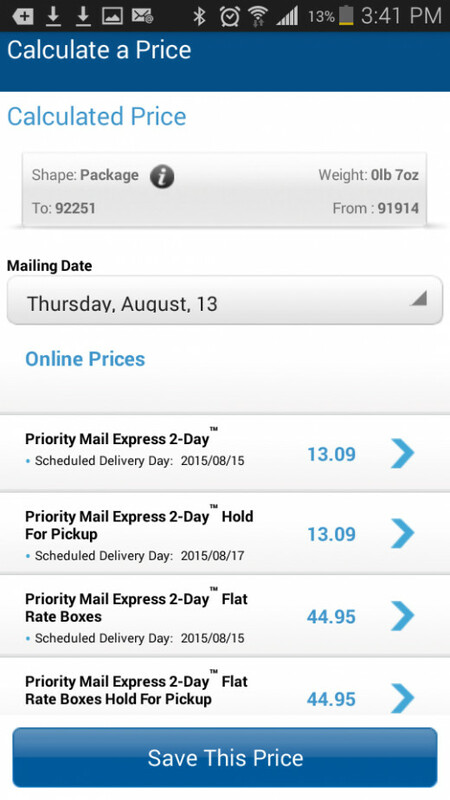 As of this edit, 8/14/2015, the interface off the USPS Mobile App has changed, mostly cosmetically. I have edited the photos here to reflect that update. On my Android phone the Scan function does not appear to work at all, and I am not sure if this is because of a change in technology from the makers of the App or a failure of my current phone. When I originally wrote this article I had an iPhone, and I would like feedback from the readers of this article concerning whether the Scan function still performs well on the iPhone with this latest rendition of the App. When I first got my iPhone a couple of months ago, I almost immediately had a wicked idea about how I could put some of our more belligerent postal customers in their place. In case you didn't catch it from my profile name I am a letter carrier by trade, and in the fulfillment of my daily duties I am constantly hounded by customers who swear that the Post Office has lost their package. It's always the same song and dance; they just got off the phone from the shipper, and the shipper swears that the package arrived at the delivery unit that morning so where the bleep is it? Although I am by no means attesting to the perfection of the Postal Service, many companies like to shift the blame to the Post Office just to get an intractable, fire breathing, verbally abusive person off the line. In the meantime the customer's product is still probably gathering dust on one of their warehouse shelves, not even having been shipped yet. It might seem amazing to you, but the pathetically outdated scanners the Postal Service currently uses do not have the ability to track packages. So when I got my iPhone it occurred to me that by installing the USPS Mobile App I could track packages for customers in real time, right there on the street, and either confirm the customer's evil opinion of the Postal Service or get them off my back by proving that the shipper is really at fault. The fact that our woefully deficient scanners cannot do this and I have to use my own phone for it might be the subject of another hub, but in the meantime I'll call off the dogs and be nice to my employer for a change! 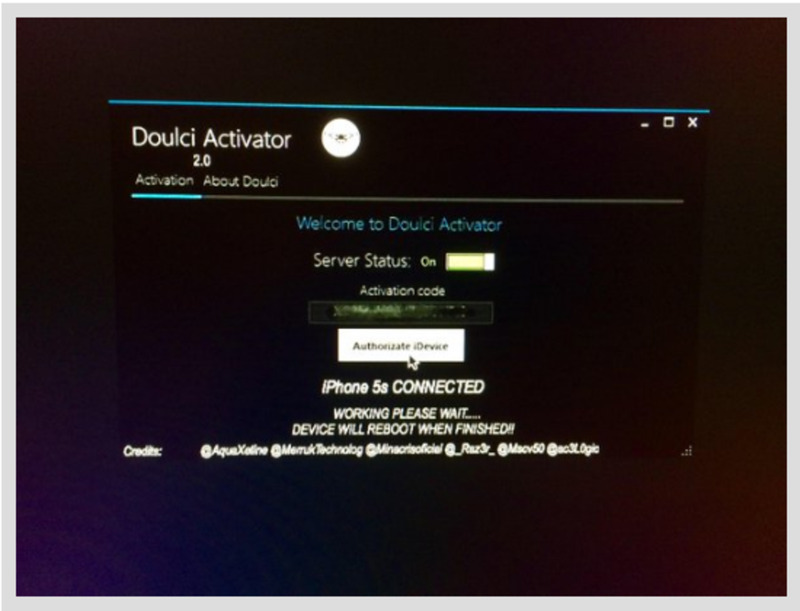 Need a smart phone for the Mobile App? 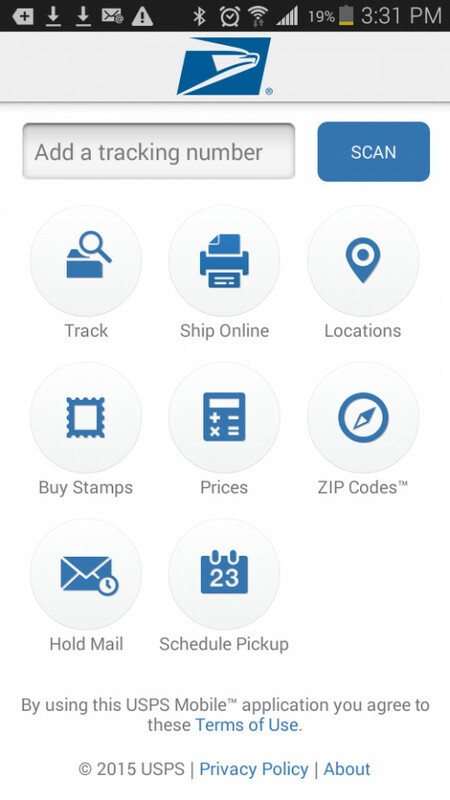 Unlike the rather cumbersome and mystifying usps.com website, the USPS Mobile App is easy to navigate. When the user clicks the App's icon, a screen opens up that displays 10 different functions, most of them useful for postal customers and employees.. I shall describe these functions in the following sections. Many years ago as I was driving through Yuma, Arizona on the way to the East Coast it occurred to me that I had forgotten to turn off the ice maker in my refrigerator. For some reason I had visions of my refrigerator bursting open with the weight of all that excess ice and filling my house to the ceiling with ice cubes. Silly idea, I know, but I actually spent two hours driving around Yuma looking for a post office so that I could mail my brother in law the house key and he could turn off the confounded thing. If we only had smart phones in those days the Mobile App's Locations function could have saved me a lot of time by immediately locating either a Post Office, an affiliate Post Office, a self-service kiosk, or a collection box with a listing of its collection times. Upon pressing the Locations icon the system prompts for the user's location so that the App can automatically find these amenities without having to type in an address. It even alerts the user to stores that sell stamps and also displays a nifty map for locating all of these various services. Your Aunt Maggie moved to the Imperial Valley to be closer to heat and Godzilla-sized grasshoppers, and you want to mail her the usual package of Christmas-themed undergarments because your generosity knows no bounds. Even though you have her new address, in your haste to shoo her out the door you forgot to get her Zip Code. 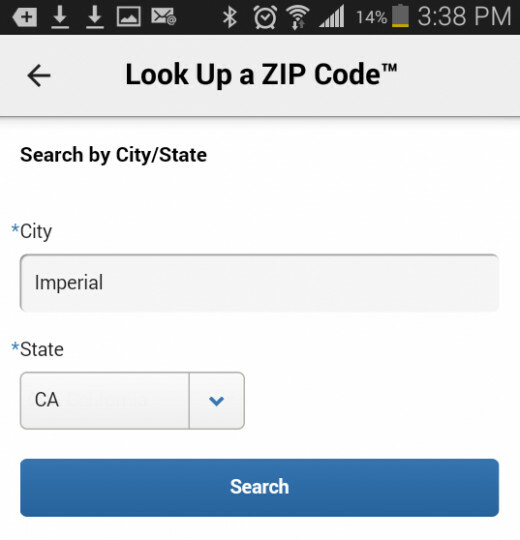 That's fine, because the Zip Code function on the Mobile App can find it for you. 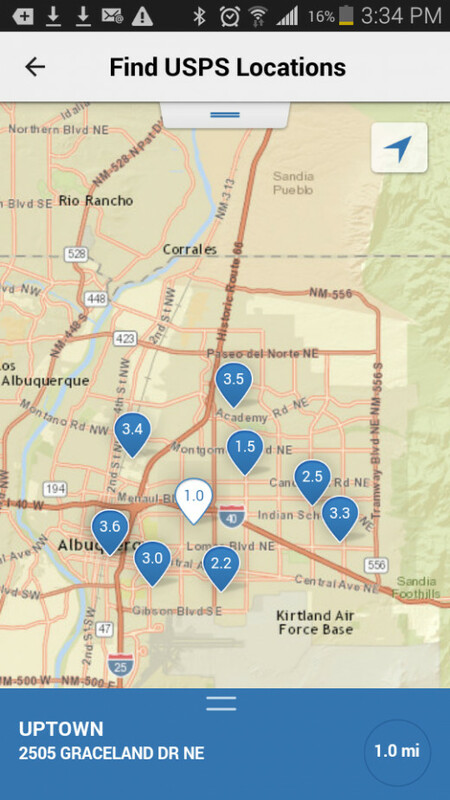 It can look up a Zip Code by address or city, and it can also return all of the cities in a particular Zip Code. No excuse not to send Aunt Maggie her Santa undies now! You love your dear old Aunt Maggie in spite of her chronic halitosis and sagging support hose, but Santa's on a budget and you don't want to go crazy on the postage to ship that underwear. Your concerns are duly noted by the Mobile App's Prices function, which displays either flat rate shipping costs for products such as Priority Mail (if it fits it ships), or calculates a price based on the item's destination (including International), and shape. One of the most useful components of the Mobile App is the Track function. My youngest son abandoned me in my dotage to go to party school at San Jose State, and I have already sent him two care packages loaded with essential foodstuffs like Fruity Pebbles cereal and Starbucks cards. 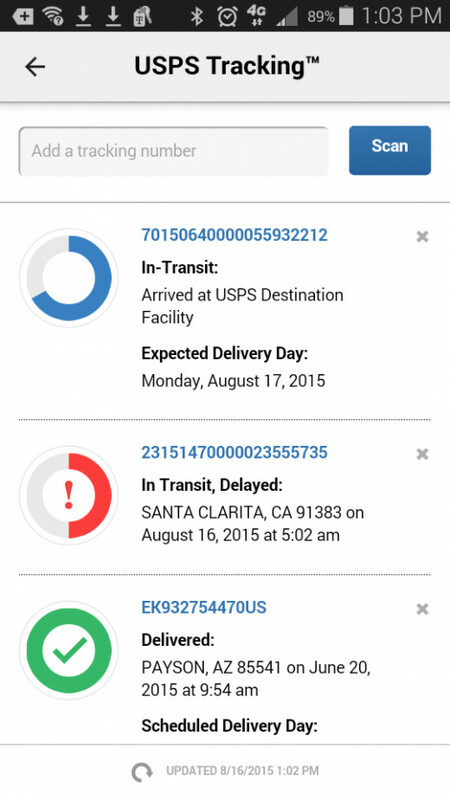 The Track function allows the user to enter the tracking number for a package, certified letter, or other items. The search results track the item through the entire delivery process, and the ongoing tracking process can be given an easy to remember nickname. Note: If you did not actually pay for delivery confirmation, look at your postal receipt. There is probably a tracking number on there anyway, which can be used with the App. Don't tell anyone, it's a postal secret. In preparation for the approaching holiday season you might want to make a few extra bucks knitting cute little fuzzy reindeer caps and selling them on E-bay where, to paraphrase the comedian George Carlin, "Your stuff is crap, but my crap is Stuff." I knew a guy who knitted one of these caps that was so realistic the cat attacked it and shredded it down to raw yarn in a matter of seconds. Anyhow, you don't even have to go to the post office to ship these items, which are obviously going to be in high demand. 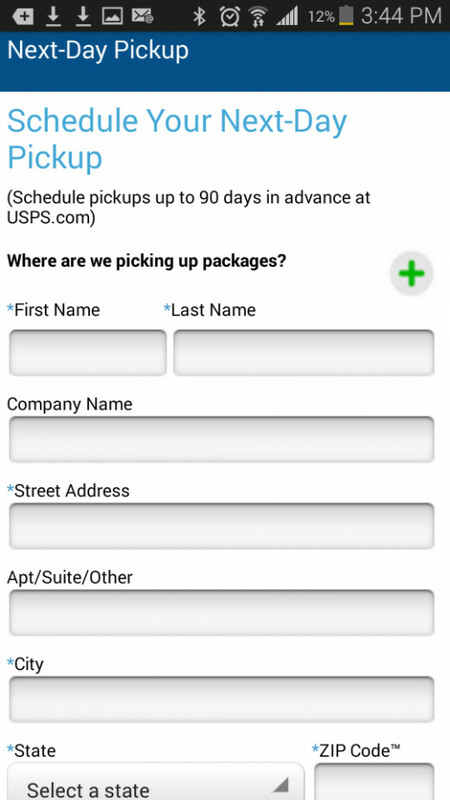 If you have the ability to print a shipping label at home you can use the Pickup tab to schedule a pickup by your letter carrier. This function on the Mobile App can only be used for next day pickup. If you absolutely need to schedule a pickup up to 90 days in advance you need to do this on the usps.com website; and good luck trying to figure out where to find it there. UPDATE 8/14/2015 - It appears that the Supplies function has been disabled in the latest version of the App, probably because of people ordering boxes to use for purposes other than shipping. You can also order free shipping boxes via the Get Supplies tab on the Mobile App. Just for fun I ordered some, having heard from business customers in the past that it can't be done unless you have an account with the USPS. I tried to verify this on the usps.com website first, but on that sloppy, unkempt mess whose layout looks something like Oscar Madison's bedroom it took forever to find the right link and it did not offer any details about who is eligible. I recommend using the Mobile App over the website if you can get it. It's much cleaner, like Felix Unger's room, but not as obsessive compulsive. Anyway, I ordered 10 large Priority Flat Rate boxes to use to ship survival items like printer ink and Oreo cookies to my son. The order history of the shipment is stored on the Get Supplies tab, but quite truthfully this function does not appear to be for tracking the order's delivery status. However, I am pleased to report that I received the shipping supplies on 9/26, a mere six days after I ordered them. The Mobile App delivered as promised! My first exposure to the incredibly useful Scan function was when I saw one of our distribution clerks using it to track a package's history. I think it is a sad testament to our in-house postal technology when an employee has to use his own iPhone for work purposes, but our pathetically outdated postal scanners are not equipped for this function. The scanner on the iPhone App can be used to scan regular bar codes or QR codes. 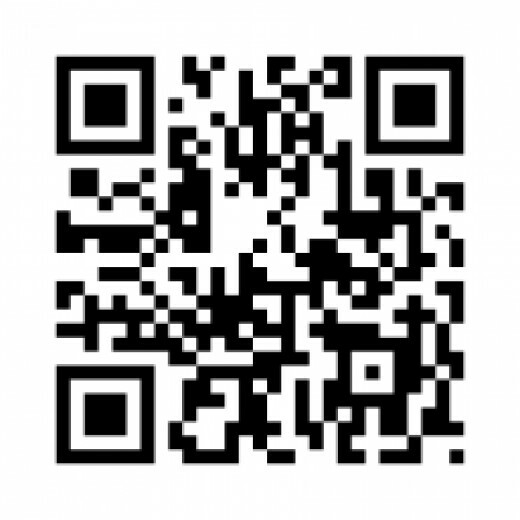 QR codes have been around for a few years now, but in case you've been vacationing in the Alpha Centauri system for the past decade or so, the image below is of a QR code. At the present time Letter Carriers are not dealing with QR codes, but that is subject to change. I believe the Postmaster General's five year plan involves implementing mail pieces that use the QR code, so these little inkblot tests could quickly become relevant for both postal customers and employees. At the present, the Scan function is extremely relevant for Letter Carriers. 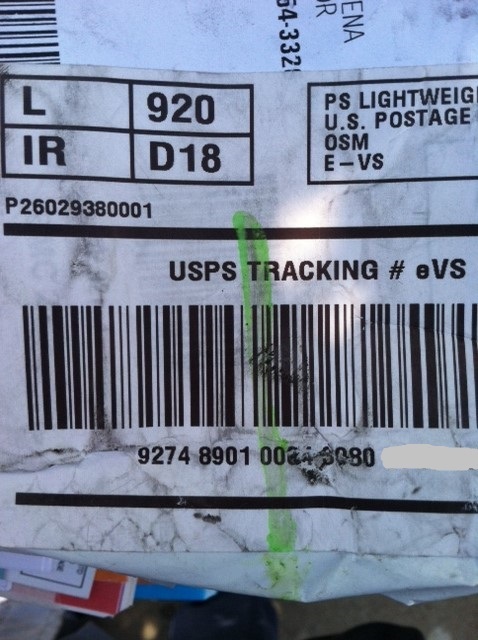 The other day I had a package with an unreadable bar code. The numbers were also smudged and my postal-issue scanner was not liking any of the numeric combinations I was attempting to input manually. 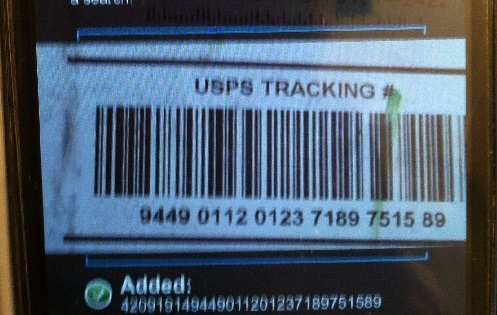 Here is the bad bar code, just to give you an idea of what a postal employee is up against at least once or twice a day. Not wanting to be called on the carpet for missing a scan, in desperation I remembered my Mobile App. Remarkably, the App succeeded in reading the smudged bar code and I was able to view the unreadable numbers and manually input the data into my old clunker postal scanner. Unfortunately, the scan can not be uploaded from the Mobile App. But if you are a letter carrier who finds an unreadable bar code, the odds are that the Mobile App can help you get the right numbers so that the scan can be completed and a severe headache avoided when your supervisor knocks you in the noggin with your useless scanner. Your darling Aunt Maggie just left you a voice mail saying she is stopping by for a month-long visit. The 110 degree heat in the Imperial Valley is causing her to swoon, and the monster grasshoppers swooped down like a Biblical plague of locusts and consumed all of her begonias. Naturally you need to get out of town fast! But you don't need to waste time going to the Post Office to stop your mail anymore, you can do it right from your smart phone, using the handy Hold Mail feature on the Mobile App. I don't really want to conduct an experiment for you by stopping my own mail, but the feature appears to be fairly self explanatory. You simply input all of the name and address data on the screen and then press the Confirm Address button. A postal supervisor will receive the message on the computer and print the Hold Mail request for your letter carrier. 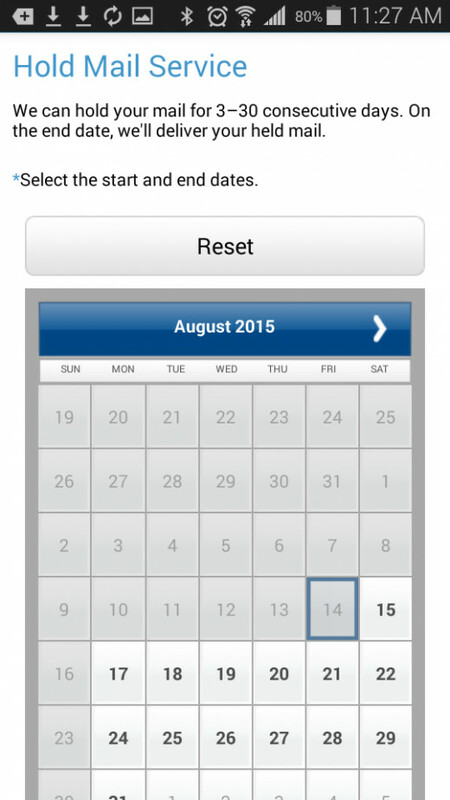 UPDATE 8/14/2015 - The Android version of the App, and possibly the iPhone version, no longer has a Coupons function. I'm not exactly sure what the Coupons function is for. As far as I know there are not currently any coupons for 10% off Forever stamps, or any other postal products, but I may be wrong. It is possible that there may be retail merchandise such as greeting cards, shipping products and so forth that may be purchased with a coupon. Anyhow, the Coupons function allows the user to store a coupon in the App by taking a picture of the coupon's front and back. Nifty, I guess, but sort of mystifying from a postal perspective. Postal Employees don't even get discounted postage, like a lot of people think. UPDATE 8/14/2015 - There is no longer an About function, at least on the Android version. The About function contains the usually legalistic rigmarole. The compulsory Terms and Conditions link contains about 50,000 pages of legal jargon. If you can slog through that you are a much better man or woman than I. There is also a link to USPS.com, which I absolutely do not recommend unless hair rending frustration is your thing. The Mobile App greatly simplifies the incomprehensible mess you will see on the website. Finally, there is an About USPS button that provides a brief paragraph or two containing mostly pro-postal propaganda. 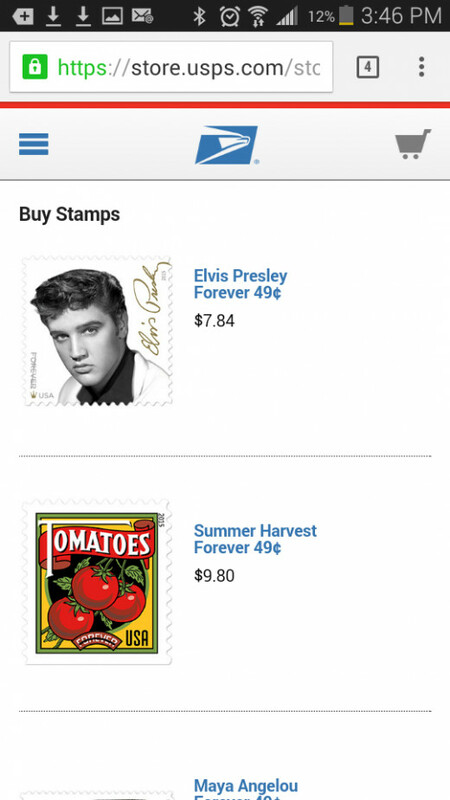 In the latest version of the App stamps can be purchased. I believe this will be a very useful feature for customers, particularly because the old Stamps by Mail forms that were in widespread use in the past are now hard to come by. There, I got you through it! I hope that for a dry technical description I have made this relatively painless. I enjoyed writing this description of the USPS Mobile App and I hope I have piqued your interest into obtaining this fantastic product. The App is free, by the way, in case I neglected to mention it. As I stated before I have no personal stake in the success or failure of this product, I merely felt that I should share my enthusiasm because I have never seen a postal technological offering deliver as this one does. It works much better than anything postal employees actually use on the job, and if you are a postal customer it can significantly ease the difficulties you get from dealing with the Postal Service. Look at it as a little blue pill for your postal pain. Who Is the Most Postal-Friendly Presidential Candidate, and Why Should I Care? 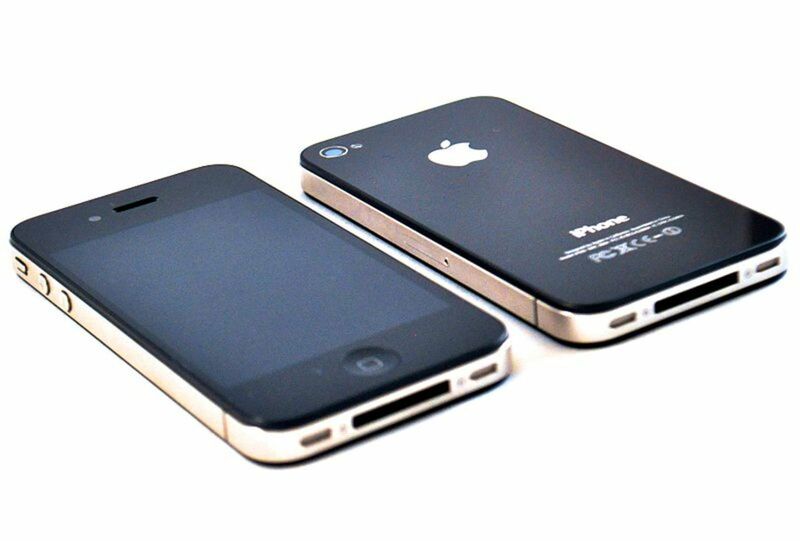 What is iPhone Baseband and Modem Firmware? The mobile app reads scans better than the postal scanners can. Don't get a smart phone if you can avoid it, you'll just be getting your beautiful bird shots interrupted by your hub pages notifications. It's a distracting little toy. Thanks for reading! As always, great material, Mel. I don't have an i-phone yet, so I cannot do apps, but this is a very tempting reason to get one. Heck, I recall those crappy scanners that we used at the PDF for next day air mail. Slow as molasses, and couldn't read a lot of what they were supposed to, unless it was printed crystal clear. I think you know my usual views about the company that produces it, which is why I had to pinch myself to make sure I was awake when I discovered they had actually produced a competent product. I guess I'm bucking for tech writer now. Thanks for dropping in! I know absolutely nothing about the Canadian postal service except that I think they drive red trucks. It seems logical they would have something similar for your iPad. Thanks for reading and taking the time to comment. I never realized that learning about mail carriers and their job could be so interesting until I started reading your hubs, Mel! (By the way, I've just realized the significance of your HubPages user name. That's clever!) 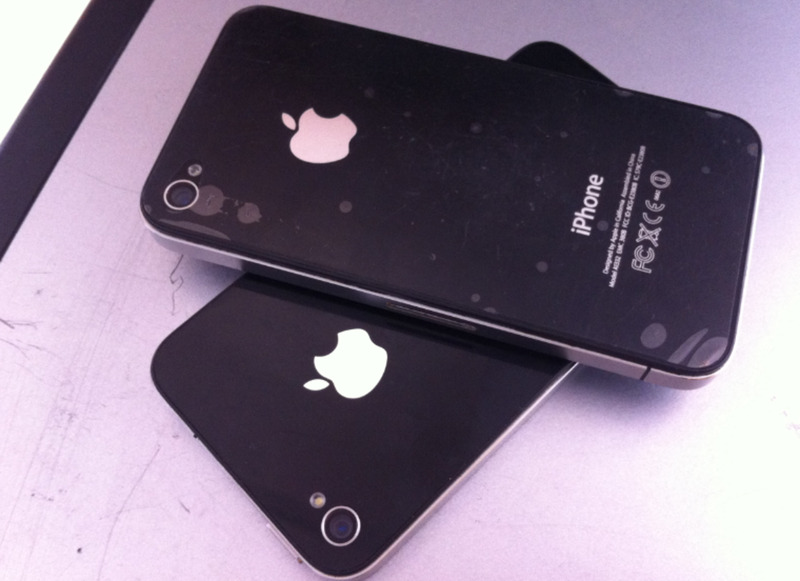 I would love to get an iPhone, but the monthly charges here in Canada are just too expensive. I have an iPod touch, though, and I love it. The app that you've described sounds like it is very useful. Sometimes there are people who are not computer savvy who don't know how to track their own packages and will simply accept it when a customer service rep tells them that a package should have arrived. It's frustrating, but this App is really useful for resolving these issues. Thank you for dropping by! Very interesting. I don't have a smart phone so all of the apps do me no good. That said, I don't know why the customers get on your back about it and you have to have an app to show them where their package is at any given moment. I'm sure most people who order stuff now do so online. All they have to do is go to the website where they placed their order and click on a link to track their own package. There may be a few sites that don't offer that service, but most do and I've found the tracking to be very accurate. I guess those people are just too lazy to do it themselves. When the postal service actually does something right it is such a rare event that it needs to be reported. Thanks for reading! Mel, this article is fascinating as well as entertaining. I'm very excited with the opportunities the post office has made possible for people sending packages, especially online sellers. Thank you so much for this information!